• Meets or exceeds Telcordia GR-1221-CORE-Reliability Qualification Requirements for Passive Devices. variety of standard connectors or customized endfittings. • Exact positioning of fibers. 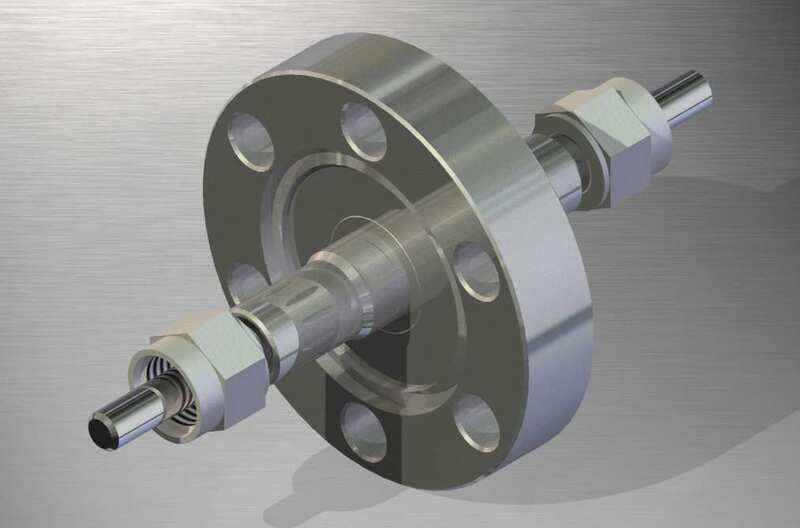 • Center-to-center pitch from 150μ to 5mm. • Vacuum compatible tested to 10-9 Torr. • Chemical resistant: acids, bases, and organic solvents. • Radiation resistant: gamma, e-beam, fast neutrons, and x-ray resistant. • Operating wavelengths from 180nm to 2400nm. • Overall lengths up to 100 meters. hexagonal, or whatever the application calls for. • Bifurcated, trifurcated to complex multiple leg assemblies. concentric-to-(2) spots, or whatever the application calls for. specific input/output distribution, precision spaced. • Wide assortment of end terminations and furcation joints. • Laser polished fiber ends. • Highly conductive copper ferrule in nose connector. • Anodized aluminum heat sink. • Custom design HP-SMA (High Power) connector. 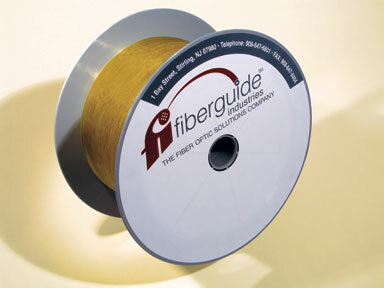 • Small fiber diameters incorporate a pure fused silica sleeve at tip. • Standard core diameters of 100μ, 200μ, 300μ, 400μ, 600μ, 1000μ, 1500μ. • Extremely high tensile strength. • Stress and chemical corrosion resistant. • Aluminum buffer is hermetic. • Sterilizable using ETO, steam, e-beam, or gamma radiation. • No outgassing or oxidation. • All buffers/coatings certified by NAMSA under USP Class VI for Biocompatibility. • Lowest loss for Ultraviolet (UV) through Visible (VIS) applications. • Specialty coatings available (see Gold and Aluminum Data Sheets). • Maximum laser damage resistance for holmium (2100nm) and Erbium (1500nm) laser delivery. • Large core-to-clad ratios available. • Core diameters available up to 1500μ (Nylon and Tefzel? buffers). • May be sterilized by ETO, steam, e-beam and gamma radiation. Polyimide buffer may be autoclaved (heat resistant). • All dielectric, non-magnetic construction. • Polyimide buffer resists most organics, solvents, and acid. 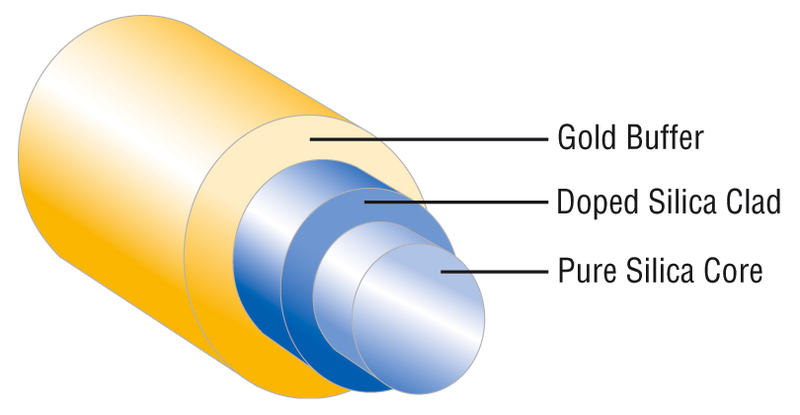 • Thin wall polyimide buffer (12μ to 15μ). • Lowest loss for Visible (VIS) through Infrared (IR) applications. • Maximum laser damage resistance for Pulsed Dye (595nm), Excimer (193nm), HeNe (633)laser delivery. • Superior concentricity and core-to-clad ratio. • Large numerical aperture (N.A.) fibers. • Strong bonding of the hard polymer to silica. • Broad operating wavelength range. • Sterilizeable by ETO or gamma. • Hard polymer cladding is removable with acetone. • Large numerical aperture(N.A.) fibers.